KATIE TWEDDLE was born in Romford, Essex and is currently completing her third year at the Guildhall School of Music and Drama, studying with Daniel Jemison. She is thus following in the footsteps of her mother, Karen Tweddle, and Karen’s passion for music initially inspired Katie to pursue this legacy. Katie is a stable second bassoon in the London International Orchestra and performs annually at Cadogan Hall. She has also performed in the BBC proms at the Royal Albert Hall with the National Youth Orchestra of Great Britain. Other venues she has proudly performed in include the Barbican Centre and the Royal Festival Hall. 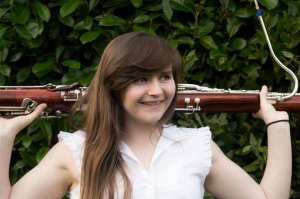 In 2014 Katie won the Havering Young Musician of the Year title, playing the bassoon, having won the Junior title two years earlier on the recorder. Katie has enjoyed greatly the opportunity of working with the Havering Concert Orchestra this term. As well as music, Katie loves lifting weights, running and eating cake.